Scores much higher than a SIX. Flying up the glass elevator at the front of the Baltic (NE8 3BA) takes you to one of the highest and greatest views in Newcastle – not a bad place to try some of the best food the city has to offer. The sixth-floor restaurant is elegantly decked out, and a table view with a perch over the Tyne is worth a trip alone. We managed to get a table while a special £4 starter/dessert, £10 main was on (5-7pm), but very quickly the restaurant was busy, full of lively chatter. We were seated with some ciabatta and butter – always a good start. One wobbly table and one DIY-attentive waiter later, our starters arrived. I opted for scallops with black pudding and peas (£9.95, pictured above). A beautifully presented dish, and one stacked up bite had me claiming “best starter ever”. 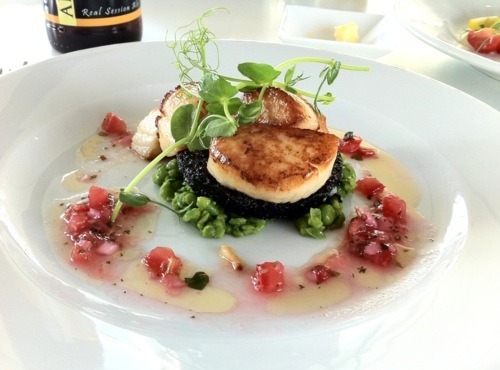 Really good – plenty of large super-soft scallops, sitting on rich black pudding and crunchy peas. A drizzle of tart vinaigrette cut through the meaty flavours perfectly. My partner went for a simple tomato, basil and goats cheese salad (£4). Again, this came out looking appetizing (for a salad! ), and was refreshing, scattered with little puddles of tasty creamy goats cheese. Though i could have easily had the scallops again, the menu choices are so good we took a while to pick a couple of mains; the menu should suit all tastes, with everything from John Dory to venison, changing regularly. I finally settled on mackerel with white bean and chorizo fricassée (£10), and Kate has rump of lamb, carrot puree, spring veg and gremolata jus (£16.95). Both were beautiful. The lamb was served pink, not bloody but succulent, tender and well-seasoned, though I’d have preferred it a little more charred on the outside. Its accompanying jus were deep and full of flavour. The mackerel was soft and fresh, and great with little nuggets of chorizo and beans. Portion sizes were generous. There were many fish dishes on the menu – and judging from this, I’d have no trouble going back for more. The wine menu is really well stocked with just about anything from £20 onwards, as well as local beers from Allendale Brewery, and some great (if expensive) cocktails and aperitifs. Stuffed from meat and fish, we saw a few tables receiving some lovely looking desserts, so couldn’t resist the lemon meringue pie (£6). It came with a surprise lemon sorbet, a super refreshing palate cleanser. The meringue was sweet and gloopy, stacked atop of cake, biscuit and strangely, ice cream. Satisfying and enough for 2 to share. At some point the food had to end(!) – and while it wouldn’t be unusual to get a £100 bill here, we escaped at £60ish. SIX has no mandatory service charge. After our meal we decided polish off some lovely Chilean merlot (£4.50 175ml) and Allendale Wolf (£3.60) in the observation deck/bar overlooking the Tyne, a great place to enjoy an after dinner drink. Whilst the booming of the Evolution Festival down below was somewhat annoying, I’m sure we’ll be returning to the sixth floor soon. A must-visit. Visited on Saturday 28th May 2011 8PM.